Grapevine Technologies > Blog > Marketing > Always Proofread Before You Print! I noticed a funny typo today as I was strolling through the local department store. It reminded me of the importance of editing. In this cases, the company’s brand appeared before the customer in an actual store. 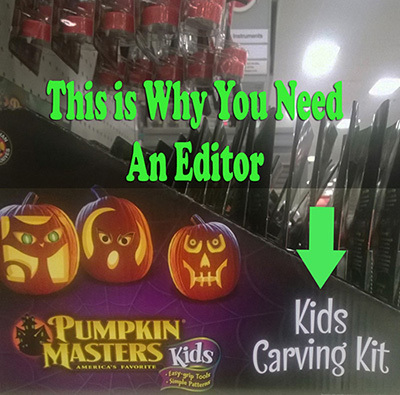 Okay, so most folks might not look twice; but I’d rather have a pumpkin carving kit myself. But has your website or online marketing put you in a similar situation? Have you found that your products’ description may be misread? It may be subject to misinterpretation, but it only takes one unhappy customer to tip the boat. It’s easier to fix any issues before they are a problem. With a search engine optimization consultant, we conduct thorough keyword research to ensure that we don’t make the same mistake. With an online marketplace, Pinterest, Twitter, Facebook, and all the other social media venues, there are bound to be opportunities for typographical errors. In other cases, a product may have several uses. Sometimes, the message’s intent may be viewed differently from several perspectives. Thus, it is always best to double check your message, especially if you are going to spend money on an expensive billboard or a mass-produced product. That’s why it’s so important to proofread and edit all of your work, even if the best managers and SEO consultants have worked on it. Everyone makes mistakes. Our SEO consulting and social media marketing company, Grapevine Technologies LLC, specializes in writing copy that is specific to your company’s needs. However, you are still the expert in your field, and we look to you to ensure that all your products are accurately represented. We can work together to make sure that we always put the best foot forward. ← Grapevine Technologies is now on YouTube!